Long-standing non-malignant pain (LSNMP) may be nociceptive, neuropathic, or a combination of both. It may originate from a variety of somatic causes, but it may also have a psychological background. Physical pain may involve musculoskeletal, vascular, and neurological systems as well as injury to organs and tissues from other disease processes and from surgical interventions. Nociceptive pain is associated with tissue damage. Neuropathic pain is, on the other hand, due to nerve injury or malfunction of the nervous system and thus may be more complex. Musculoskeletal pain is one of the most common complaints when visiting primary health care in Scandinavia. Between one-fifth and one-half of patients seeking health care experience long-term pain., The prevalence of persistent neuropathic pain ranges from 3% to 8% in different population-based epidemiological studies,,, in accordance with the studies on Swedish population.,,,, LSNMP leads to varying degrees of function and activity limitations as well as impact on quality of life (QoL). Furthermore, perceived LSNMP will affect an individual's life, spare time, economy, psychosocial well-being and capacity for work. Long-standing pain is also a major reason for prolonged sick leave and early retirement, thereby causing high costs for the national insurance system, health care, employers and society.,,, There is a lack of studies in which the International Classification of Functioning, Disability, and Health (ICF) coding is included and particularly, there is a lack of pain-based studies using the ICF. The Functional Barometer (FB) is a validated and quality-assured self-assessment instrument for patients suffering from pain. The FB is so far the only questionnaire using ICF variables based on pain. It is of importance to detect the most common limitations of patients with LSNMP and especially the differences based on a gender perspective. The aim of this study was to evaluate the function, activity and QoL limitations according to the ICF in patients with LSNMP seeking care in a University Hospital Pain Management Centre and to describe the gender differences. Out of the 346 patients referred to the Pain Management Clinic at Södersjukhuset University Hospital in Stockholm, 300 questionnaires had the quality required to be included in the study, which contains 28 questions evaluating how pain affects function, activity and QoL.,,, Of the 28 questions, 12 cover body function and activities/participation and one additional optional item variable for the patient to assess. Twelve questions reflected QoL variables and the last four were related to pain [Table 1], [Table 2], [Table 3]. FB is based on the patient's experience of pain but is also adapted to the World Health Organization (WHO) International Classification, of patients' disability, activity, limitations and participation.,,,,, All items are assessed by a verbal descriptive problem scale, the same as the ICF qualifier; the five categories were graded as 0–4. The categories defined as no (0), slight (1), moderate (2), major (3) and total (4) problems. Based on this, all patients received an ICF code and category grade for each question. Furthermore, gender differences were evaluated. Statistical analysis was performed using IBM SPSS Statistics version 23 (IBM, Armonk, New York, USA). The describing statistics were performed using n, percent (%), mean, and standard deviation. For the group statistics regarding age, the t-test was used. To compare the differences between women and men, the nonparametric tests such as Mann–Whitney tests, Chi-square tests, and cross-tabulation were used. A P < 0.05 was considered statistically significant. In 2015, 346 patients suffering from LSNMP were referred to the Pain Management Clinic. Of these 346 patients, 300, comprising 207 women and 93 men, aged between 18 and 88 years who completed the self-assessment FB questionnaire were enrolled in the study [Table 4]. The dropout rate was 9%. The duration of pain before referral to the Pain Management Unit and the occurrence of pain in different regions of the body are provided in [Table 4] and [Table 1], respectively. The ICF categories/variables and perceived pain are identified in the FB from the ICF score sets and are presented regarding function/activity and QoL [Table 2], [Table 3] and [Table 5]. Regarding functioning and activity [Table 2], the patients reported major or total problem due to pain in the ICF item variables; lifting/carrying things – ICF d 430 (61%), endurance – ICF b 740 (49%), keeping posture – ICF d 4153 (44%) and muscle strength – ICF b 730 (43%). No problem or slight problem due to pain was recorded for the item variables; dressing – ICF d 540 (66%), making bed – ICF d 649 (52%) and driving car – ICF d 4751 (47%). For QoL [Table 3], leisure time – ICF d 920 (69%), sleeping – ICF b 134 (60%), and energy – ICF b 130 (59%) were the most affected variables due to pain. No problem or slight problem due to pain was found for the item variables; gastrointestinal function – ICF b 535 (49%), economical self-support – ICF d 870 (44%) and emotional functions – ICF b 152 (41%). To the question, “How would you describe your pain: Just now?” – ICF b 280, 67% perceived their pain as a major or a total problem. Seventy-five percent reported their pain as a major or total problem during “last week,” and 26% reported that their pain was a major or total problem when it was at its “mildest.” When the patients perceived their pain as its “worst,” 96% reported it as a major or total problem and 100% as moderate, major or total problem [Table 5]. The open question (FB no. 13) is an additional optional item variable for the patient to assess, i.e., “Do you experience other limitations in your function/activity due to your pain?” The most common answers were sexual activity, sports and training, sitting/working in front of the computer, gardening, shopping, reading and writing. Comparing women and men, significant differences are found as shown in [Figure 1]. 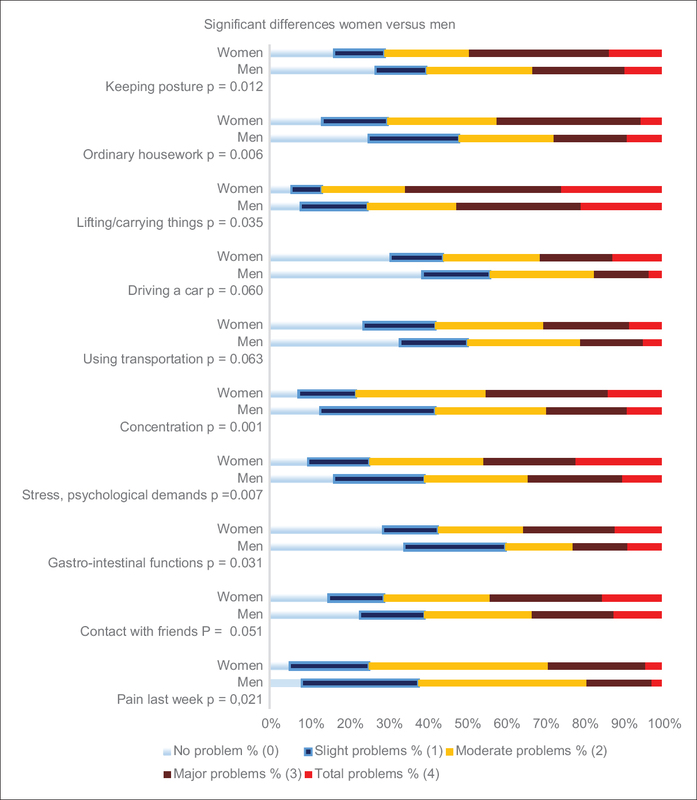 Women had significantly more limitations than men due to their pain, keeping posture (P = 0.012), ordinary housework (P = 0.006), lifting/carrying things (P = 0.035), driving a car (P = 0.060), using transportation (P = 0.063), concentration (P = 0.001), stress and psychological demands (P = 0.007), gastrointestinal functions (P = 0.031) and contact with friends (P = 0.051). There were also significant differences as women experienced more pain “last week” (P = 0.021). In the other 19 items of the FB, no significant differences were found. The aim of this study was to evaluate the function/activity and limitations in QoL patients suffering from LSNMP and to compare the gender differences. Not surprisingly, pain itself was the major problem. When the patients perceived their pain as its “worst,” all patients reported it as moderate, major or a total problem. Of the other item variables in the FB questionnaire, the most affected variables reported by the patients due to their pain was leisure time, lifting/carrying things, sleeping, energy, endurance, keeping posture and muscle strength. It is obvious that the LSNMP patients in this study are suffering from secondary negative consequences due to pain. However, there are other areas which are less affected, for example, dressing, making bed and driving a car. One can speculate why these activities are less affected, such as dressing aid equipment, self-made solutions and gender aspects. Differences in age, gender, and origin of pain have been reported in an earlier study, indicating that men more often reported physiological limitations, while women more often reported psychological limitations of functioning, activity and QoL. Women especially over 65 years of age reported statistically significant problems with “concentration,” “stress and psychological demands,” “family relation” and “contact with friends” in comparison to men and younger women. From a gender perspective, significant differences between women and men were found in this study, especially regarding cognitive and somatic functions and activities. There was no variable found that showed a significant difference where men had more difficulties than women. The significant differences between women and men highlight the difference in a gender aspect and have to be taken into account in the treatment and rehabilitation of pain patients. Thus, the result of the present study indicates that the tailored individual rehabilitation of pain patients should focus on these areas. On the other hand, no problem or slight problem due to pain was recorded for the item variables such as dressing, making bed, gastrointestinal function, driving car, economical self-support and emotional functions. These results are also important since there are functions/activities and QoL variables that pain patients may be able to perform despite pain. The results from the FB in LSNMP may be performed repeatedly to follow the effect of the rehabilitation and may also be a basis for sick leave evaluation. The sick leave in Sweden is based upon function and activity limitations despite illness. The level of limitations decides if you are able to work full-time, half-time, part-time or not at all. This study has methodological limitations with no comparison group from another pain management center. Furthermore, there are no follow-up data presented. Another limitation is that the population in the area of Södersjukhuset University Hospital has an over-representation of socioeconomic problems, immigrants and people with a low grade of education,,,,,, which may have had an influence of the results. From a total of 346 patients, 300 patients had filled out the FB to the extent that it could be evaluated, a dropout rate of 9%. Lack of motivation, language problems, illiteracy, dyslexia, and cognitive disorders were some of the explanations for not filling out the FB to the full extent. However, we believe that the 300 patients are representative for the LSNMP patients of the Pain Management Centre of Södersjukhuset University Hospital. Furthermore, the patients in this study were highly selected. Their pain was complex and they were referred to pain specialists at the University Hospital Pain Management Centre. They had been undergoing numerous treatments, without lasting improvement which is underlined by the fact that patients had been waiting for consultation for over 4 years. The majority of the patients suffered from pain from more than three regions of their body. This was independent of gender. As most of the patients had different kinds of pain from different regions of their body, it was not possible to study subgroups. Pure neuropathic pain was not possible to find as it was often combined with nociceptive pain. This would have been of interest as one may anticipate differences in limitations of functioning, activity and QoL, depending on differences in type of pain. This study shows that patients with LSNMP report several limitations of functioning, activity, and QoL when evaluated using the FB self-assessment questionnaire with the included and corresponding ICF item variables. Furthermore, there are important differences between women and men. These results are of importance and have to be taken into account when tailoring individual treatment and rehabilitation programs. A special thanks to Lisbet Broman at the Department of Rehabilitation, Danderyd Hospital, for statistical support and to Lovisa Pernsköld for admin support and to all the team members at the Pain Management Unit at Södersjukhuset University Hospital. The study was supported by grants from, Neuro Förbundet (Neuro Sweden). Hasselström J, Liu-Palmgren J, Rasjö-Wrååk G. Prevalence of pain in general practice. Eur J Pain 2002;6:375-85. Mäntyselkä P, Kumpusalo E, Ahonen R, Kumpusalo A, Kauhanen J, Viinamäki H, et al. Pain as a reason to visit the doctor: A study in Finnish primary health care. Pain 2001;89:175-80. Haanpää ML, Backonja MM, Bennett MI, Bouhassira D, Cruccu G, Hansson PT, et al. Assessment of neuropathic pain in primary care. Am J Med 2009;122:S13-21. Bouhassira D, Lantéri-Minet M, Attal N, Laurent B, Touboul C. Prevalence of chronic pain with neuropathic characteristics in the general population. Pain 2008;136:380-7. Gustorff B, Dorner T, Likar R, Grisold W, Lawrence K, Schwarz F, et al. Prevalence of self-reported neuropathic pain and impact on quality of life: A prospective representative survey. Acta Anaesthesiol Scand 2008;52:132-6. Torrance N, Smith BH, Bennett MI, Lee AJ. The epidemiology of chronic pain of predominantly neuropathic origin. Results from a general population survey. J Pain 2006;7:281-9. Information Från Läkemedelsverket. Farmakologisk behandling av neuropatisk smärta.-Bakgrundsdokumentation. Med Prod Agency 2007;6:1-41. SBU. The Swedish Council on Technology Assessment in Health Care. Methods of Treating Chronic Pain. A Systematic Review. SBU-rapport nr 177/1. Stockholm: Statensberedning för Medicinsk Utvärdering (SBU); 2006. Brattberg G, Thorslund M, Wikman A. The prevalence of pain in a general population. The results of a postal survey in a county of Sweden. Pain 1989;37:215-22. SoS-Rapport Behandling av Långvarig Smärta. Socialstyrelsen; 1994. p. 4. Available from: http://www.socialstyrelsen.se/Publikationer. [Last accessed on 1994 Mar 04]. Turk DC, Rudy TE. Persistent pain and the injured worker: Integrating biomedical, psychosocial, and behavioral factors in assessment. J Occup Rehabil 1991;1:159-79. Breivik H, Collett B, Ventafridda V, Cohen R, Gallacher D. Survey of chronic pain in Europe: Prevalence, impact on daily life, and treatment. Eur J Pain 2006;10:287-333. Pain Proposal: Improving the Current and Future Management of Persistent Pain, A European Consensus Report; 2010. Available from: http://www.efic.org/index.asp?sub=B57HFCF6J4043I. Norrefalk JR, Littwold-Pöljö A, Ryhle L, Jansen GB. Effect on work ability after team evaluation of functioning regarding pain, self-rated disability, and work ability assessment. J Multidiscip Healthc 2010;3:155-9. Norrefalk JR, Ekholm K, Linder J, Borg K, Ekholm J. Evaluation of a multiprofessional rehabilitation programme for persistent musculoskeletal-related pain: Economic benefits of return to work. J Rehabil Med 2008;40:15-22. Norrefalk JR, Svensson E. The functional barometer -a self-report questionnaire in accordance with the International Classification of Functioning, Disability and Health for pain related problems; validity and patient-observer comparisons. BMC Health Serv Res 2014;14:187. Norrefalk JR, Borg K. The functional barometer – An analysis of a self-assessment questionnaire with ICF-coding regarding functional/activity limitations and quality of life due to pain – Differences in age gender and origin of pain. Scand J Pain 2017;17:16-21. FunktionsBarometern. Part 1 and 2. Available form: http://www.funktionsbarometern.se/ pdf. Norrefalk JR. The Functional Barometer a validated instrument for assessment of pain, function and activity, directly adapted to ICF. Best Pract Smärta 2015;11:16-20. Cieza A, Stucki G. The International Classification of Functioning Disability and Health: Its development process and content validity. Eur J Phys Rehabil Med 2008;44:303-13. Norrefalk JR. The Functional Barometer - A validated instrument for assessment of pain, function and activity, directly adapted to ICF. In Swedish: “FunktionsBarometern – Ett validerat instrument för smärt-funktions-och aktivitetsanalys, direkt anpassat till ICF”. BestPractice Reumatologi 2016-07-25. Cieza A, Stucki G, Weigl M, Kullmann L, Stoll T, Kamen L, et al. ICF core sets for chronic widespread pain. J Rehabil Med 2004;36:63-8. Stucki G, Cieza A. The International Classification of Functioning, Disability and Health (ICF) in physical and rehabilitation medicine. Eur J Phys Rehabil Med 2008;44:299-302. Rauch A, Cieza A, Stucki G. How to apply the International Classification of Functioning, Disability and Health (ICF) for rehabilitation management in clinical practice. Eur J Phys Rehabil Med 2008;44:329-42. Cieza A, Ewert T, Ustün TB, Chatterji S, Kostanjsek N, Stucki G, et al. Development of ICF core sets for patients with chronic conditions. J Rehabil Med 2004;44:9-11. Norrefalk JR. Outcome of an 8-Week Multiprofessional Work Related Rehabilitation Programme for Patients Suffering from Persistent Musculoskeletal related Pain. PhD Thesis. Stockholm: Department of Public Health Sciences, Karolinska Institutet; 2006. Norrefalk JR, Svensson O, Ekholm J, Borg K. Can the back-to-work rate of patients with long-term non-malignant pain be predicted? Int J Rehabil Res 2005;28:9-16. Norrefalk JR, Ekholm J, Borg K. Ethnic background does not influence outcome for return-to-work in work-related interdisciplinary rehabilitation for long-term pain: 1- and 3-year follow-up. J Rehabil Med 2006;38:87-92. Norrefalk JR, Linder J, Ekholm J, Borg K. A 6-year follow-up study of 122 patients attending a multiprofessional rehabilitation programme for persistent musculoskeletal-related pain. Int J Rehabil Res 2007;30:9-18.